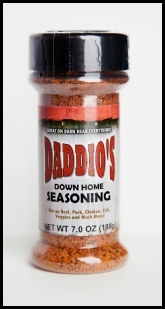 Daddio's Down Home Seasoning has been a staple in Southern Homes and our BBQ joint for almost 14 years. Developed in Byram, Mississippi by Daddio, it has since become one of the most flavorful seasonings around. The blend of fresh seasonings and spices has made it a favorite on many dishes besides BBQ! From POPCORN to PULLED PORK, many of our Customers have sent us great ideas for using Daddio's Down Home Seasoning, and we agree that Daddio’s can make many of your favorite dishes come alive!